South Greenville arrived at a very cold but surprisingly dry Alpharetta for the first game in a home-and-away series between these two elite southeast programs. Phoenix fielded a strong but young team with a number of squadmembers making their club debuts, while South Greenville was missing three players due to a wrestling conflict. Behind a solid experienced pack led by No. 8 Elliot Robinson, the Phoenix backs featured a number of exciting additions, such as scrumhalf Seb Kennett, flyhalf John Irwin out of South Africa, and diminutive winger Ben Stewart. In response, South Greenville traveled with a full 23 man squad featuring a very heavy pack led by their club captain, Keegan Taylor. South Greenville opened strongly making good ground through their very big forwards and putting the Phoenix defense to an early test. Good tackling and an aggressive approach at the rucks was the order of the day and the Phoenix forwards were up to the task with Justin Cooper, Mark DeSantis, and Jack Lavelle to the fore in the defense. In particular, a goalline stand after South Greenville had run a penalty from five meters out was of particular note. Gradually, Phoenix applied the rugby basics well and began to get the upper hand in the game despite excellent tackling from South Greenville. Sebastian Kennett went over for a try for Phoenix to open the scoring and followed up by nailing the difficult conversion from out wide. The match was testy at times with no love lost between the two packs but referee Kyle Stingley maintained control under, at times, trying circumstances. The first half closed with another Phoenix try from speedy winger Blake Bibb with Kennett again making the challenging conversion with ease. An extended halftime saw Phoenix make some experimental lineup changes with Seb Kennett moving to scrum-half to replace Tyrus Loveless, who had played a great first half, and John Irwin taking over the reins at flyhalf. Phoenix really opened the throttle in the second half of this game. 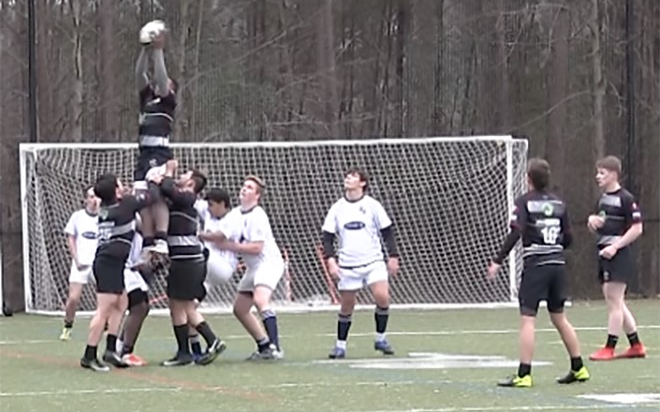 The forwards dominated the scrums, lineouts and rucks while the backs, given good ball, were creating huge problems for the South Greenville defense. In the forwards, Justice Reeder and David Hudson were immense while thundering Kyle Warmack and wily Jack Lavelle both scored well taken tries to essentially ice the game. John Irwin and Seb Kennett were most impressive, with Irwin nabbing his first Man-of-the-Match award in the US. Kennett scored another try and added a conversion. Center Tristan West provided the other Phoenix score on the afternoon to leave the final score at Phoenix 36, South Greenville 0. All in all this was an excellent opening game from the Alpharetta club and promises well for the rest of the season. However, South Greenville will be at home next week and will undoubtedly be stronger and motivated to square the series.